Sandra Torres joined the Public Health Institute Center for Wellness and Nutrition (PHI CWN) in September 2018 as a Project Coordinator. 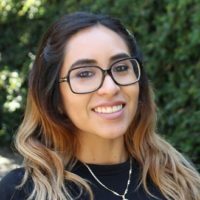 She provides training and technical assistance to social service agencies in implementing Healthy CalFresh Initiative activities and campaigns including the promotion of CalFresh and other nutrition and food benefit redemption at local farmers markets. Sandra comes to us from Ventura County Public Health Department Tobacco Policy Program and Tobacco Education and Prevention Program where she managed the Bus of Tobacco Horrors, a mobile hands-on educational exhibit which educates youth on the physical dangers of tobacco use and much more. Prior to her tobacco work, Sandra worked as a CalFresh Outreach Specialist and a Community Health Leader responsible for conduction outreach, education, and enrollment for CalFresh in the Central Valley region and Ventura County. Sandra comes to CWN with a wealth of experience and strong commitment and dedication to making an impact in communities across California. Sandra received her Bachelor of Science in Health Science with an emphasis in Community Education in 2013 from Fresno State. Currently, she is pursuing her Master’s degree in Public Health with a concentration in Health Policy Leadership from the University of California San Francisco.